That’s not dialogue from a Kung Fu movie from the 70s. 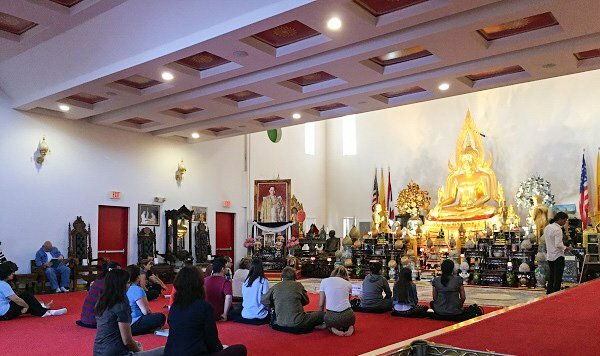 That’s a meditation class at Wat Buddharangsi Buddhist Temple of Miami. For years, I’ve been hearing about this temple, but it’s deep in Homestead far from everything, so I had never bothered to go. But now that I’m finally learning to vacation where you live instead of living where you vacation, I’m hitting up all these wonderful Miami attractions. Because of tree coverage, you could drive right past the temple without even noticing it. But when you pull into the parking lot, you’ll be transported into another world. I visited Thailand just a couple of months ago so it was especially striking to see a Thai temple in the backyard of my hometown. The grounds of the temple are vast and calming. Beautifully manicured gardens line the temple’s exterior. A large statue of the Buddha towers over the colorful flowers. The temple sprawls like a traditional Thai temple with large courtyards surrounding it on every side. There are small alcoves and altars scattered throughout the grounds. You may even find a tiny Buddha carved into the trees outside. Prayer flags flap in the wind, and you’re surrounded by a peace and quiet that you can probably only get here in Homestead. 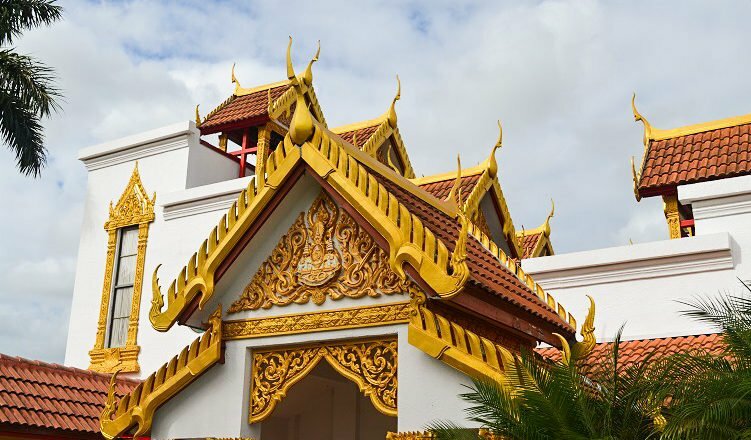 The inside of the temple’s religious hall was created in the likeness of many traditional Buddhist temples in Thailand. The construction and design of the buildings was overseen by a Thai architect. 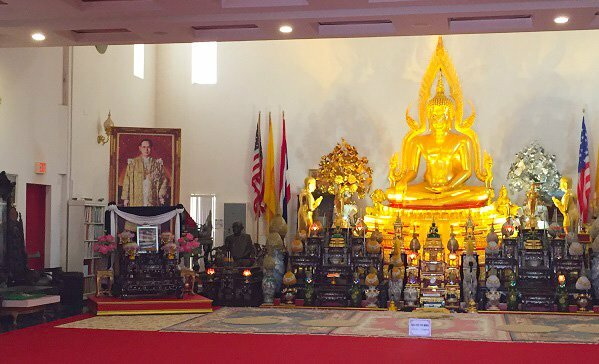 And the large golden statue in the main hall was created by an artist in Bangkok. Along with the tropical trees that dot the landscape, everything about Wat Buddharangsi feels like Thailand. One of the many things that took me back to my recent trip was the large altar to the king who died last year. But in addition to that, you’ll find Thai signage and script all over the temple grounds. Even the signs for the bathroom are translated in Thai. In the main hall, you can sit down on the floor and enjoy a quiet moment. They even have pillows available to make your meditation more comfortable. It’s probably worth mentioning here to the savages that live in South Florida that this is a place of worship. Out of respect, you should not wear shorts or tank tops when entering the main religious hall of the temple. You should also remove your shoes and leave them outside on the shelves they provide. You should not point your feet directly at the Buddha when you sit down and you should not lie down on the floor. There is also a section directly in front of the Buddha that is reserved for monks, which you shouldn’t walk on. There are signs that clearly state this information outside the temple, but I saw every single one of these things within the first five minutes I was there. 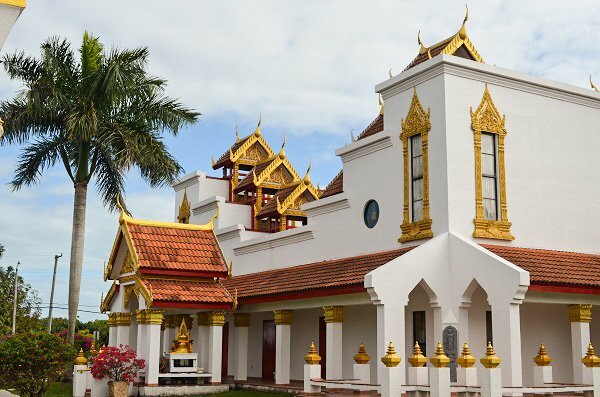 If you’re respectful and open to new experiences, the Wat Buddharangsi Buddhist Temple of Miami offers meditation classes every Saturday in Spanish, and Sunday in English from 3 pm to 5 pm. The classes are a good way to learn about Buddhist teachings and learn to practice guided meditation. 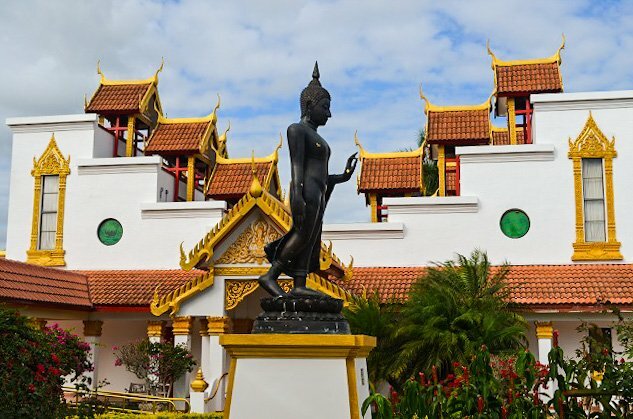 During some Buddhist holidays, Wat Buddharangsi also offers weekend retreats so you can get away from city life for a couple of days and practice living like a Buddhist monk. Whether you’re willing to commit to such an exercise or not, the temple is an amazing place to go for a couple of hours and just enjoy the amazing architecture and the peace and quiet. It’s open every day from 7 am to 5 pm, and the monks are happy to sit and talk with you during that time. You can thank them for their time by giving them a small offering like fruits, daily necessities, and drinks. It looks beautiful! I had no idea this was right in our backyard.